Last week a fanfare of press trumpets heralded the launch of Bomb Sight, an online map showing just where Luftwaffe bombs fell on London during the Blitz from October 1940 to June 1941. 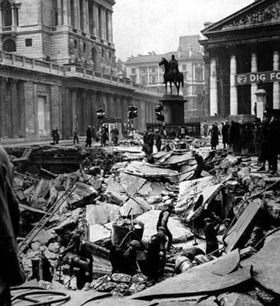 The Bomb Sight team from the University of Portsmouth "geo-referenced" the Bomb Census Survey maps held at The National Archives and "digitally captured the geographical locations of all the falling bombs recorded on the original map". Bomb Sight is the brainchild of geographer Dr Kate Jones, of the University of Portsmouth. She told the BBC: "When you look at these maps and see the proliferation of bombs dropped on the capital, it does illustrate the meaning of the word Blitz, which comes from the German meaning lightning. 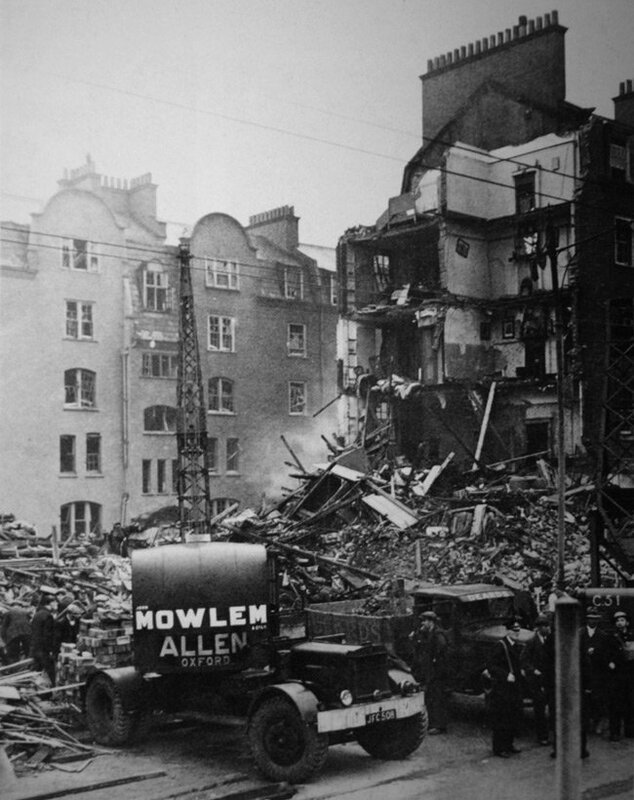 It seems astonishing that London survived the onslaught." The site invites the public to get hands-on with "our interactive web-mapping application to explore and search for different bomb locations across London". 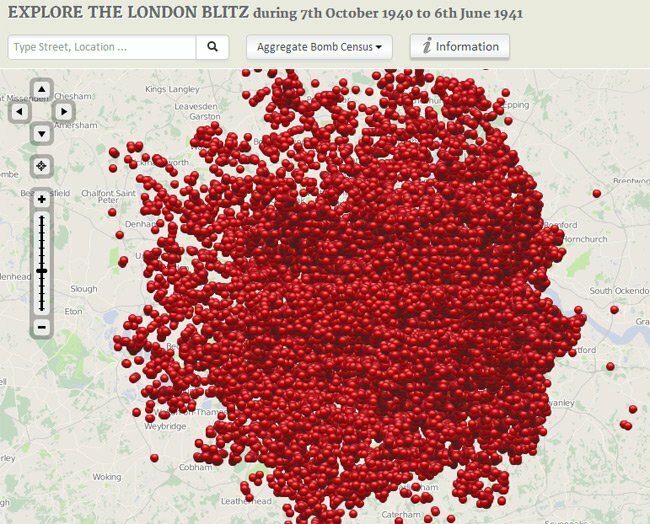 It adds: "Click on individual bombs and find out information relating to the neighbouring area by reviewing contextual images and memories from the Blitz." However, it can offer "no warranty to the accuracy, completeness or fitness for purpose of the information provided", and a quick trip around London demonstrates just how incomplete it is. 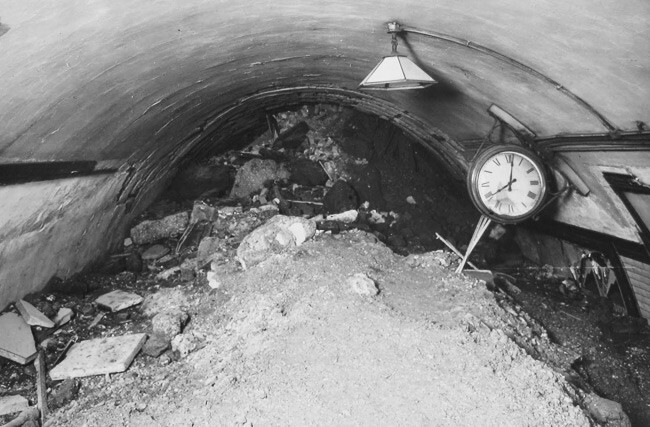 On 11 January 1941, a bomb hit the Central line ticket hall at Bank tube station, killing 57 people, and leaving a mighty crater (pictured above) outside the Bank of England. The day before the Balham disaster, though, an even greater tragedy struck Stoke Newington in north London. 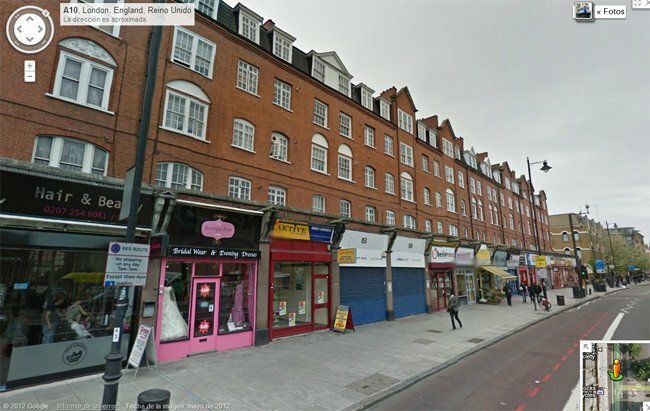 At around 8.30pm on Sunday 13 October, a high-explosive bomb plunged through the Coronation Avenue flats on Stoke Newington High Street, and exploded directly above a shelter made up of three interconnected basements. That the the above examples don't feature on Bomb Sight is, of course, an omission in the original Bomb Census Survey maps, which are incomplete and, given the wartime confusion, often inaccurate. 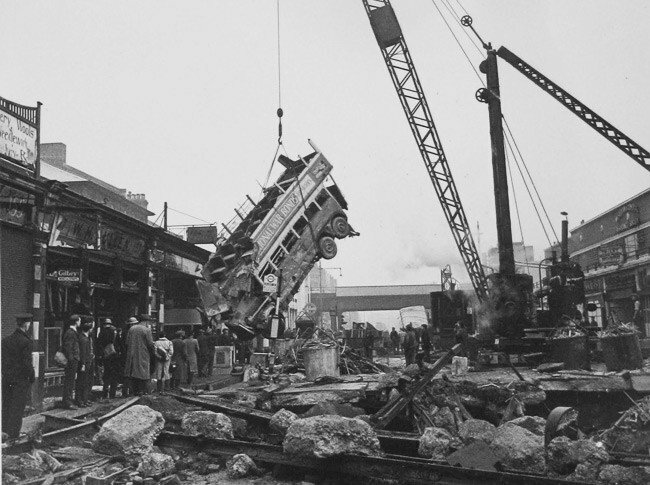 Just how anarchic things were during the height of Blitz is demonstrated by the Coronation Avenue death toll, which has never been exactly determined. Bodies were distributed to various mortuaries, some makeshift, and not even dedicated research can fix the final figure. The BBC has an eyewitness account here, and below is an extract of our own interview with Mrs Blanche Litwin. Well, the night that it happened they put us to sleep under the table, six of us. There were the usual bombs and guns – you know, barrages of gunfire and everything like that. What happened was suddenly there was this terrible noise, it was like a shlooshing sound, like an express train rushing past. We didn’t actually hear a bang. There was this huge-sounding vibration and everything shook and we knew it was very near. The windows blew in, bits of not actual masonry but dust seemed to be falling everywhere. My sister, my younger sister, became hysterical, and all the other children and my father and Mr Cohen ran out to see what had happened. 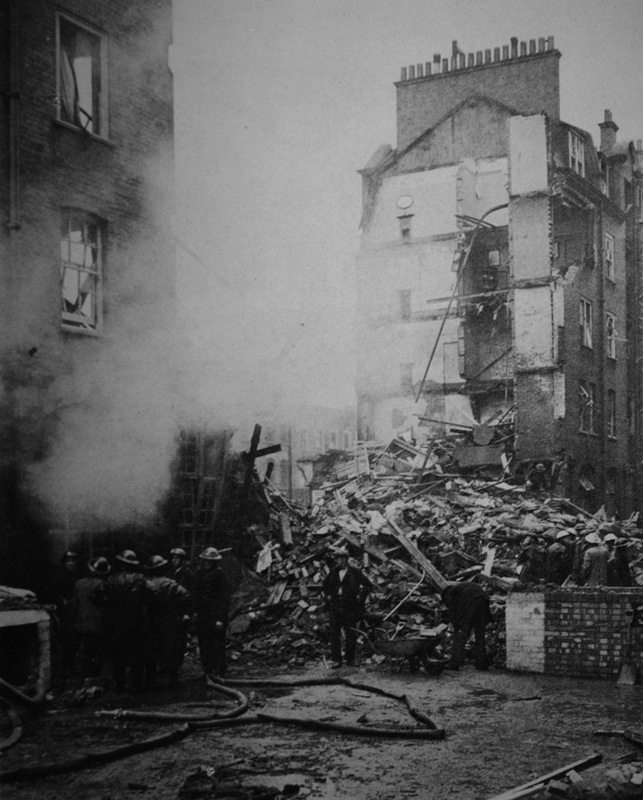 They came back about two minutes later and said a bomb had fallen on Coronation Avenue and had hit the air raid shelter – that lots of people were trapped in there, and they were going out to see if they could do anything to help. They were gone all night, and when they came back in the morning my father and Mr Cohen looked terribly grim, very grim. They said that lots, hundreds of people had got killed. They just couldn’t get them out, and I remember them both saying that the people were drowned and they were gassed. Then the shelter, sorry the building, the building had fallen on top of the shelter and they were just trapped. There was just nothing anyone could do. I remember one family, Helen Danziger’s family, her mother, she was the first-aid person in that shelter, and her father, I think he had stepped out of the shelter for a couple of minutes to smoke a cigarette because you weren’t allowed to smoke in the shelters. He was just at the entrance to the shelter when everything started happening. He saw it actually coming down and he dashed back in again to be with his wife and he was killed too. So both her parents were killed. There were so many people there that night who shouldn’t have been – people who were just visiting friends for the day and people said to them "Come and stay with us down the shelter tonight – don’t go home", and this is how they were trapped. It’s amazing, isn’t it? *The book's a good read, and if you fancy supporting this worthy cause, email TimeLine here.